Home Stacy Has Finally Made It! Stacy Has Finally Made It! Though Stacy Keibler has graced our screens for years with Nitro, Thunder, Raw and SmackDown – it’s only now in 2008, that Stacy’s television career is set to take off! You know you’ve really made it when you sit on the panel at the Television Critics Association press tour, which takes place every summer! It is at the TCAs that the networks dish dirt to the critics about the upcoming television season which begins in September. Every major show and every major television star you can think of has had their presence felt at the TCA tour… which is why it’s so odd to see Stacy sitting up their on the panel! 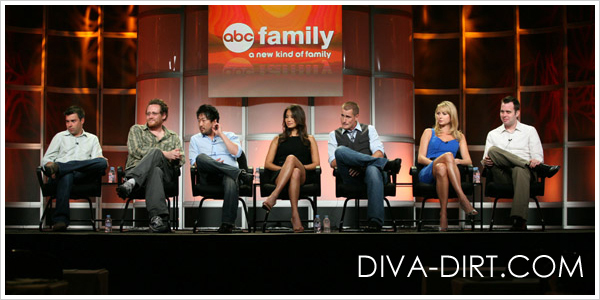 Stacy repped her brand new show, Samurai Girl at the ABC Family leg of the tour accompanied by the rest of the cast and the show’s executive producer. We all know that critics can be tough (just the other day at the Eli Stone panel, someone reminded the show’s lead Johnny Lee Miller about his ill-fated marriage to Angelina Jolie. Ouch. ), so in the same vain – I would think Stacy’s “colourful” wrestling career would be brought up at some point. Lord knows, it’s probably something Stacy would like to bury deep down in that closet.